I had conceived this article a few weeks ago and, in light of last week’s heartbreaking news about Roy E. Disney, I feel it is more poignant than ever. As members of the Disney community, the early part of December is used to celebrate the life of Walt Disney. By the middle of the month, however, that celebration becomes a sad reminder that of all the wonders Walt presented us with. What is often times overlooked, however, is the fact that Walt Disney was not the only Disney to pass away in mid-December. Among the other Disney family members to have passed away during this period of the month is Roy O. Disney. Walt’s brother, best-friend, and partner in everything that the Disney name created, Roy was the other half of what made the Disney shows, movies, and endeavors so successful. He, more often than not, stayed out of the spotlight and worked tirelessly behind the scenes. So proud of what his younger brother was creating, he put off his retirement to see the first phase of Disney World completed. In fact, it was Roy himself who renamed the project Walt Disney World so that everyone would forever know whose dream they were achieving in Central Florida. 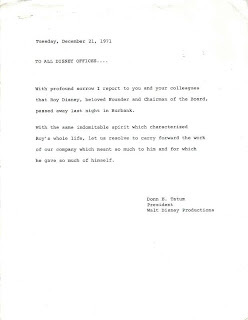 When Walt passed away, Roy sent out a two page memo to the Disney Company about the impact Walt had had on the company and the world and where they would all go from there. When Roy departed this world, Donn Tatum sent out a two line/two paragraph notice. While it was certainly less that Roy deserved, it did include this sentence, “With the same indomitable spirit which characterized Roy’s whole life, let us resolve to carry forward the work of our company which meant so much to him and for which he gave so much of himself.” Truer words have never been spoken. The middle of December must be, I could only assume, an unbearably hard time for the Disney family. For the Disney community, and the larger world, we must always remember that while it may have been started by a man and a mouse, there have always been a plethora of remarkable individuals, named Disney and otherwise, who have worked tirelessly to create wonderful worlds and magical places. I can only hope that each of us work with the same indomitable spirit that Roy possessed toward making tomorrow a bright place to live for everyone and to the betterment of the Disney name. Well done Ryan. I was at Disneyland for the first time over Walt's birthday. It was definitely magical.